The Piedmont province extends 1,600 km (1,000 mi) from Alabama to southern New York, and consists of highly complex metamorphic and igneous rocks that have been thoroughly weathered to produce a surface of minimum relief. The metamorphic rocks are primarily schist and gneiss, and the igneous rocks are granites, commonly slightly metamorphosed. Structural basins, the result of horst-and-graben faulting, are filled with Mesozoic sediments and are commonly called ‘Triassic-Jurassic basins.’ These land-derived sediments form sandstones and conglomerates, and are host to features such as dinosaur prints, rain imprints, ripple marks, and plant and freshwater fish fossils. These Mesozoic rocks are interbedded with dark lavas in many cases. A few especially hard rocks have resisted erosion and exist as monadnocks throughout the Piedmont. Stone Mountain is a 380 m (750 ft) dome of slightly metamorphosed intrusive igneous rock. The faces of Jefferson Davis, “Stonewall” Jackson, and Robert E. Lee are carved into Stone Mountain. Pine Mountain is a linear monadnock of quartzite in western Georgia, stretching nearly 100 km (60 mi) and trending northeast-southwest. Kennesaw Mountain is the site of a Civil War battle, and is set aside as Kennesaw Mountain National Battlefield Park north of Atlanta, Georgia. Graves Mountain is a significant location for mineral collection, including lazulite, gem-quality rutile, and kyanite. Beyond kyanite, the Piedmont is also a source of granite, granite-gneiss, and marble as building materials. Historically, the region is also significant in terms of coal and gold. Richmond, Virginia was the first location of coal mining in the country from a Triassic basin. The first gold rush in the country occurred in the Dahlonega area in Georgia. A public effort of gold-panning in the mid-20th century provided enough gold to put gold leaf on the Capitol dome in Atlanta. 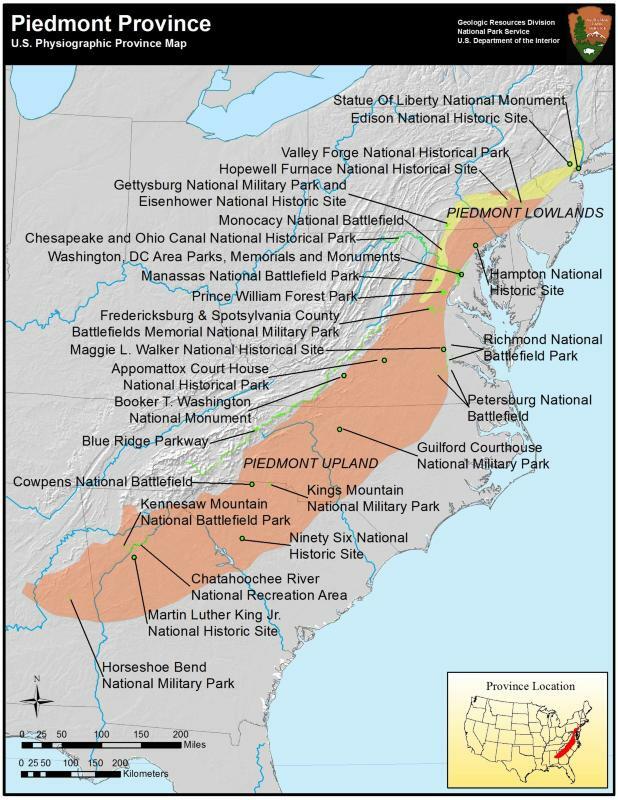 The Battle of Kings Mountain is an excellent example of how landscape and geography can affect the outcome of events. Learn about topographic maps and the famous battle that took place at Kings Mountain. Use this lesson as a stand-alone classroom activity or as a pre- or post-field trip activity. Students will construct and interpret a map using map elements and locate places and describe the human and physical charactristics of those places.